Parkinson's has no cure, but exercise, like dance classes for people with the disease, has been shown to improve symptoms. When Alan Alda revealed on Tuesday that he has Parkinson's, he had some advice for others with the disease. "If you get a diagnosis, keep moving!" he said on Twitter. He said he keeps physically active by taking boxing lessons, playing singles tennis and even doing a little juggling, adding a video clip of him doing just that. It turns out that his advice is medically sage. Doctors say that Parkinson's patients who exercise have better outcomes, in some cases even slowing the progression of the neurological disease. Roughly 1 million people in the U.S. suffer from Parkinson's, which severely affects movement in its later stages. There is no cure. In an interview with NBC News, Dr. Jay Alberts of the neurological restoration center at the Cleveland Clinic said his most recent research shows that even eight weeks after stopping exercise, the benefits stayed with Parkinson's patients. Alda’s approach — engaging in different types of physical activity — is in line with Alberts’ recommendations. He said any kind of exercise can be effective. High-intensity exercise seems to be the best bet. A study last year looked at three groups of people with Parkinson’s. The group that did not exercise at all showed some signs of worsening symptoms; the group that did moderate exercise showed negligible decline; and the group that exercised vigorously showed significant improvement, researchers said. But high intensity isn’t the only factor. Alberts stressed that for people with Parkinson’s, which affects the brain, exercise is as much for the brain as it is the body. 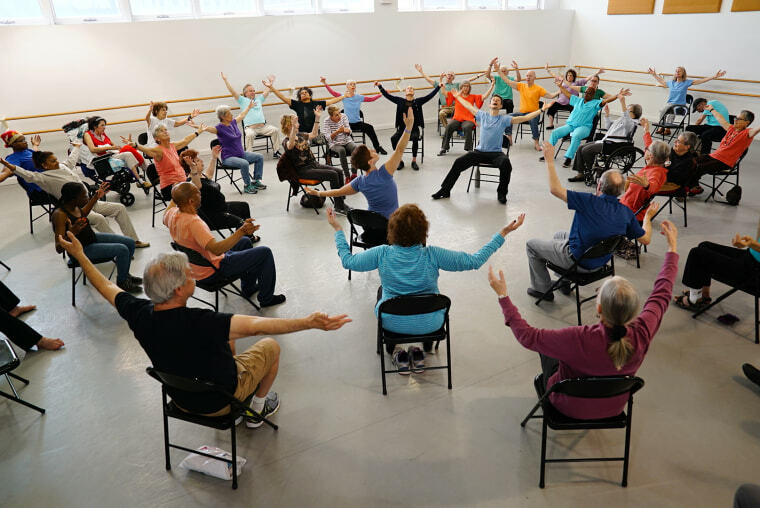 Dance for PD is a dance class designed specifically for people with Parkinson’s. Started in New York City in 2001, it’s now available in 45 states and 25 countries around the world. No prior dance experience is required to participate. David Leventhal directs the program, based at the Mark Morris Dance Center in Brooklyn. He said dance is an ideal form of exercise for people with Parkinson’s because it provides mental and physical exercise. The class is structured for people at all stages of the disease, with some in chairs, some standing with balance assistance, and some who are able to move across the floor. The dancers learn choreography from professional repertory, adapted as needed. Leventhal said he sees improvement in the skills of the dancers who come to the class. They often report better balance and sense of confidence, rhythmic attunements, sense of belonging and social interaction. But Parkinson’s disease remains something of a mystery. The speed of the progression for Parkinson’s varies from patient to patient, and it’s impossible to say how long exercise can keep symptoms from worsening. Experts aren’t exactly sure why exercise works either. For a disease with no cure, "keep moving" seems to be a way to keep symptoms down and spirits up.